Today it was a pretty chilled day nothing major happened although my body has been aching a lot. I've been feeling a little bad because I haven't been able to read the Qur'an as much as I was hoping to. So In Sha Allah I will try and do so tomorrow (Saturday). I feel like the day was wasted I wish I did more but having aches and pains is a struggle and it can be difficult. Well that's all for today! As always take care and think positive. I have to admit today was a really good day because I woke up earlier than usual - 11:30ish. I was so happy and felt like I can get a lot done. But I did do other things. Not really creative though, because I was spending my time learning things. Can you believe it is already the 11th day? :O the speed at which these days are going is amazing. I hope that you all are keeping a good mind and the right intentions. Again I apologise for not updating but I am catching up and fortunately it's not a lot either. I hope you are all doing and making sure to keep positive thoughts all the time. I'm sorry for not updating these few days, I've been ill and adding to my illness it doesn't help. I'm a little disappointed today because I wasn't able to fast and I truly wanted to. I wasn't able to to read the Qur'an either because I was not feeling so well. However, I will let you all know that I am not giving up on hope, Allah will let me read and fast when it's right for me. Guess what? I'm ill. On top of my illness I have a cold and a sore throat. I don't feel too good. Most of the time I was sleeping and my body was in doubley pain. Which didn't help at all. So today was another day. I can't believe that it's already day 7 done. I hope that everyone is having a wonderful Ramadan and make sure to always stay optimistic and busy not only is it a good exercise mentally but physically too. Men you should help your wife with the chores to help them be at ease and make things easier on them too, it's not a responsibility that was said for only for women to serve her husband and do housework. It's for both. Women you have to make sure to understand and appreciate that your husband is working and providing for him, his family and that family includes you. Be patient with each other, the Prophet (PBUH) helped his wives with their housework even after coming back from a hard day of labour. As did his wives who took care of the home that he provided for them. I hope you're all doing well. I completely forgot to post yesterday so I'm just going to do it now. Basically it was a pretty chilled out day. I haven't been doing much but just chill. I didn't read the Qur'an either but I'm planning on Friday. Nothing happened out of the ordinary. Just been really productive like write up my story for my co-writer. Anyway that's all for today. Hope all is well with you. I am going to try and keep this one shirt because I don't want to take up much more of my sleep then I already have. Okay today I wasn't fasting and didn't read either because I was sort of taking a break day. I had other things to do today but I didn't want to make anything but my health a priority this time. My health today was fluctuating a lot as usual and yes I am taking my medication. I wish I could do more but things takes time and this is something Allah has given me to test my patience and to see how well I do. Fasting wise I was asked by many of I was fasting and how it was going and most of the people I told know about my salty so I told them. I also asked them and this year around I must admit I think people are finding it a lot more at ease. Which I hope In Sha Allah that it will be a more at ease and peaceful one. Don't overwork yourself and make sure your intention is pure no matter what action you're about to take. Ok well that's all for today :) I shall catch up with you all in my next Diary entry. If you can I would love to hear how you are all coping with iron those who know people who are fasting what's it like for you to know someone who does this every year for a whole month? How does it affect your surrounding and environment? If it doesn't how do you think it will be better next time and what would you change? Leave a comment below and let me know a little about your experience. Hope you all had another wonderful Ramadan. Today like I said I would be reading the Qur'an and read as much as I can which I did. I ended up reading quite a lot, given my health and Alhamdulilah I think this year would be the first year for me to finish reading the Qur'an fully after a long time and in such a short time as well. Ok so today as I've told you all is that I won't be fasting because I wanted to give my health a break and boy was that a good choice or what. I ended up waking up at 5pm! :O That's way too late even for me. :( my health wasn't so good the whole day and I didn't even pray! Which I feel horrible about. :( The is no excuse to miss your Salah in my current situation there just wasn't. So tomorrow I've planned to dedicate the whole day spiritually which I hope to achieve In Sha Allah. I won't be fasting tomorrow either but I will definitely keep up to my promise of making up my Salah and reading the Qur'an. I hope you all had a good day, we all have mishaps and no one perfect but just remember to be true to yourself and Allah because he is always watching over you. Anyway I don't want to be any late in my sleep so I shall say goodnight and make sure to read all your dua's for eating or even sleeping (in every activity). I know I sort of let you all hanging after my last post about my physio aappointment. In fact I had another after that. I was always meaning to catch you all up but I end up doing something else. If you follow me on my Instagram you would see me posting some of the recent artworks I've been doing. So today one of my cousins came over and they said something that made me so happy. 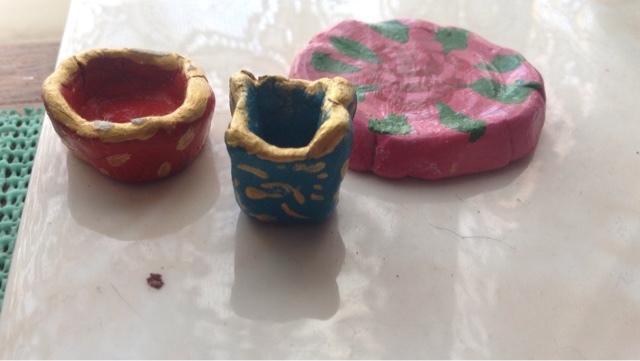 They were looking for a clay activity to do with their class, and they needed a video and they stumble across mine and the children made small pots as gifts for Mother's Day! That made me so happy to hear the fact that they watched my video and made their own creations as well. Really motivated me to do more and upload more. So I can't wait to do more!! I know it's been awhile since I've done anythingn or even written here but I shall be writing more because I feel like I've been neglecting this blog I hope to do more and share more of my thoughts with you all. So for now I'll save you for my activity tomorrow by saying that I have my first ever physio which I'm curious to know exactly what would be happening. So I should let you all know what happens when I get back. I have to sleep now because I have to wake up really early in the morning (which my body feels a lot of pain from but it needs to be done) so I shall talk to you all after my appointment. Hope you are all well. I know I have posted much in the last month but I do want to try and post more from now on. So if you have been following me on my IG or Twitter you would know that I done some crafts! So I wanted to just share them here with you! I hope you like these miniatures I am working on another miniature already and would be posting the finished product soon! 1) I have an IPhone 5 so now I can take good quality pictures!! Not the ones from my IPod because they weren't in such good quality but I still love it! I will still be using my IPod because it was a gift so I would always cherish it. But i will be taking pictures with my new phone. Also I am still trying to get used to it so hopefully I will be more active. 2) I have got all the supplies needed to start my own clay work! 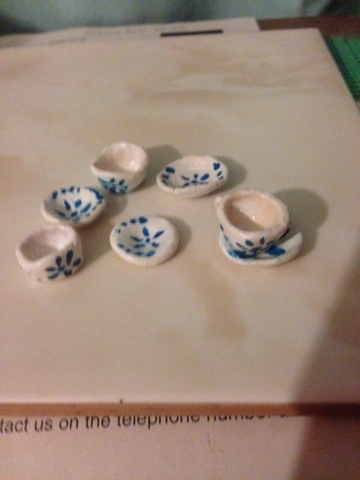 I am really excited about it and I can't wait to share with you my new crafts I have already made my first piece a few days ago - I haven't painted it but I will still show you what it looks like at the end of this post. 3) I have a lot of art supplies and things that I want start work on so I will be bringing you some of my artwork! 5) Also I have a clear IPhone case so I will show you how I make pattern paper and cut them to fit my phone case. Which I am excited to share as well! 6) I will be doing a lot of filming in the next coming week with my craft work like clay, making your own pattern paper and phone cases, charms (more in the future) drawing, painting, writing tips and much much more!! 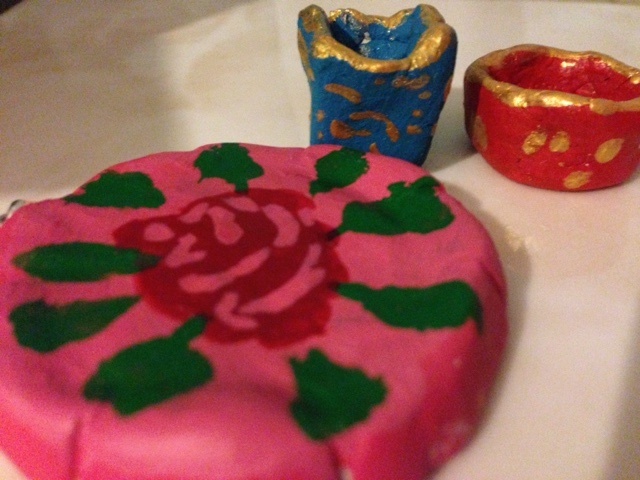 I also made these two piece just a ball and a diamond which I will also be painting as well. Hope like it so far and I would have many more to come. I apologise for the late post but I really want to work on preparing for this. I will be making the video for my creation and the painting of them tomorrow. I will post pictures of the finished pieces of my first creations after I paint them tomorrow too. They will all be il up on my blog, Instagram and Twitter. This post is a pre-post, and should be posted exactly on New Years Day where is live. So in the UK, London. I wanted to write something special for you all so that I could be a part of your New Year just like you are part of mine! :D I normally spend every year watching the fireworks that happens in the London Eye with my family, and just like every year we have the best seats. Our living room. It's cosy and beautiful and safe as well. On 2013 I predicted sort of how things would be in 2014, I said people would be more optimistic, big changes will happen in my family and one of those changes would be that my big sis would get married. I was shockingly right about all three! My sister did get married this year! Alhamdulilah! So that was the big thing that happened in my family. About people being more optimistic I don't know if you noticed but everywhere you look something positive is happening. For example, I don't listen to music but my younger sister would tell me the lyrics of some of the songs and they are optimistic. The same with movies and tv shows. Maybe it's just me but honestly saying that's what I feel went down. I told my big sister and youngest sister and when these things did happen my youngest sister said to me how I was freakishly right! And no I'm not a psychic, I only have Allah to thank for what I have and believe. She asked me today (a day before New Years) what my prediction is. I said I don't think it's a psychis thing maybe just intuition. So I said to her I think in 2015, that this year would be a productive year, not just for me but everyone. For me it could be my novel? Health? Marriage? For others it could be an exam, organising an event, anything! But I believe that this year would be a productive one and there would be bumps along the way but it would be worth it in the long run even if you can't see it at the time. Anyway, I just wish you all a very Happy New Year. Stay positive, thinking optimistically will help you be more confident and realise many things that you may not realise otherwise. I hope you all have a wonderful and eventful year ahead. Control the way you think and you would be able to avoid doing any wrong. Seek forgiveness and pray to Allah to keep you safe. Remember, He is always watching you. If you are one of those people who managed to get a ticket to the fireworks that's happening at the London Eye, then be sure to be safe and stay with your loved ones and also help out wherever you can. There's no harm in helping someone. Well that's it for my post. Oh except for one thing. My New Years resolution is to be myself, take care of my health. Think of Allah. Be with my family as much as I can. And to do good and spread the optimism as much as I can.